CultureCon gave Towson University community members a journey around the world all within the University Union Potomac Lounge on April 9. Members of Capoeira Malês DC demonstrated capoeira, an Afro-Brazilian martial art, with kicks, leg sweeps and flips. S-nemeh Barnes, a junior majoring in information technology, was among the capoeira performers. Barnes said his mother took him to a capoeira class when he was seven years old, and he’s been practicing the martial art ever since. Barnes is currently in the process of starting a capoeira club at Towson. Although he said the club probably won’t officially launch until next semester, he hopes to attract a “ragtag team of capoeiristas” in the meantime. Barnes said people interested in getting involved with capoeira can contact him or Foreign Languages Department Chair Lea Ramsdell, who will be sponsoring the club. Barnes also demonstrated the berimbau, a Brazilian instrument that consists of a wooden bow (verga), a steel wire (arame) and a hollowed gourd (cabaça). The musician plays the instrument with a stick (baqueta) to produce sound, a small stone or coin (dobrão) pressed against the wire to change the tone, and an optional rattle (caxixi) to accompany the berimbau’s music. 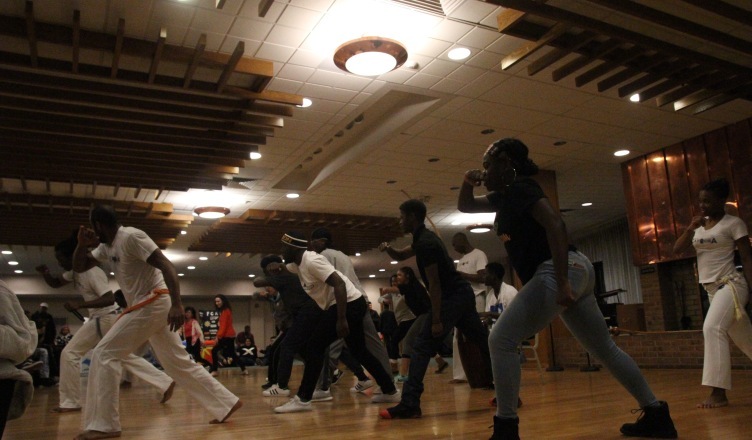 Freshman biology major Ife Alabi performed a series of routines as part of the Black Student Union’s Rhythm step team. When the time came for audience volunteers to participate in the capoeira demonstration, Alabi’s Rhythm teammates pushed her onto the stage. Alabi said she had fun trying capoeira for the first time and that she might even return for round two sometime. Pasión, a Latin American dance group at Towson, performed as well. Junior Katie Benisch has been dancing with Pasión for three years now. “I’ve been dancing all my life, but I actually just joined the club my freshman year because I wanted something to do,” she said. “The club is very welcoming and you don’t need experience to do it or anything. Benisch, a Spanish and international studies major, said she enjoyed seeing Towson’s diverse campus and student organizations being represented at CultureCon. Erin Frias, president of the Filipino Cultural Association at Towson, said she became involved with the club when she was a freshman to learn more about her own culture. Now a senior, Frias is happy that she’s been able to connect to her Filipino culture. Attendees tried tinikling, a Filipino dance that involves two people tapping and sliding two bamboo poles on the ground, and a third person dancing over and between the poles. Barnes said CultureCon showcases the importance of learning about cultures different than your own.